Serghei Sadohin is a project consultant in APCO Worldwide’s Brussels office. Situated at the crossroads between East and West both politically and geographically, the elections in the Republic of Moldova have always been geopolitical since its independence 25 years ago. The last presidential elections on 13 November 2016, where the president was elected directly for the first time in the last 20 years, was no exception. Media headlines in Europe and beyond have described the Socialist Igor Dodon’s victory over pro-Western Maia Sandu – as part of a global ‘trend’ where Kremlin-friendly leaders were elected in the US, Bulgaria and Estonia in a matter of weeks. As part of the same trend, Dodon’s election was regarded as a vote of protest against the ruling elites. Many would certainly consider that Moldovans had some legitimate grounds for such a ‘protest’. Since 2014, various anti-government protests were shaking the country after 15% of the country’s GDP simply vanished from three Moldovan banks under the tutelage of a government formed by a coalition of three parties calling themselves “the Alliance for European Integration”. Alas, many Moldovans who voted for Dodon blamed the pro-European vector of the ruling class for the rapidly deteriorating situation in the country. Before campaigning against each other in the elections though, Dodon and Sandu were united in protesting against the ruling government, and one man in particular, Vlad Plahotniuc, described by the New York Times as Moldova’s “feared tycoon”. Mr Plahotniuc doesn’t hold any official political post but is said to control the Moldovan parliament and the country’s major media outlets. Paradoxical as it may seem, the current ruling elite is believed to be the actual winner from the victory of the ‘pro-Russian’ president-elect, despite their own ‘pro-European’ aspirations. First comes the classic ‘divide and rule’ strategy. Now that the elections are over, the two powerful voices against the ruling government are already disunited. Secondly, despite favouring closer ties with Russia, Dodon is seen as a more comfortable negotiator than Sandu for behind-the-scenes political ‘horse-trading’, which became common in Moldova’s recent political history. Although the Western-leaning majority in the parliament will continue to hold the power on the country’s strategic and geopolitical vectors, Moldova’s weak institutions might allow the president to unnoticeably expand his powers. In fact, even before Dodon’s investiture, the parliament is already considering changing the constitution to give the president the final say over the nomination of the prosecutor-general. Furthermore, since the president is elected directly by the people for the first time since 1996, he will enjoy greater legitimacy in the eyes of the public compared to his predecessor. By addressing the nation and meeting world leaders, an active president like Dodon can gain enough visibility and political capital to steer the public opinion in his preferred direction. The constitution allows the president to bypass the parliament by organising referendums on vital issues. For example, Dodon favours entering into the Russian-led Eurasian Economic Union and sees the fractured Moldovan state as a (con) federation between Moldova, and two pro-Russian regions Transnistria and Gagauzia. 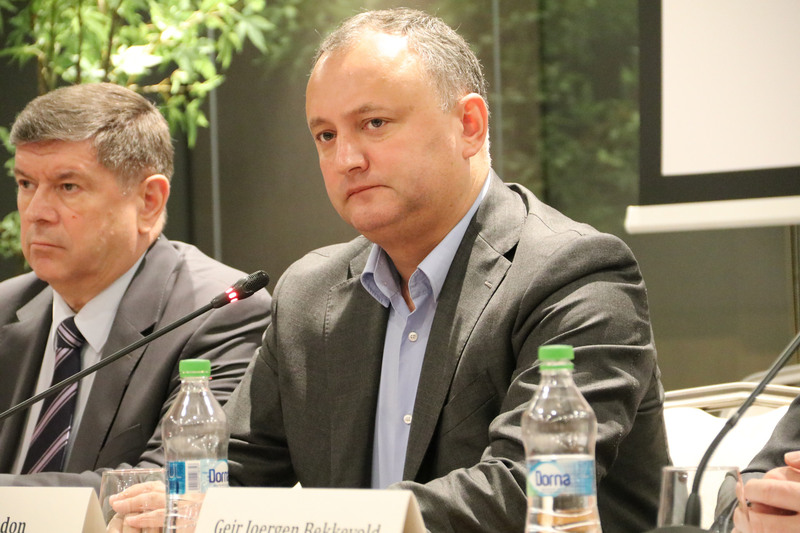 When it comes to Russian troops in the separatist Transnistrian region – Dodon vaguely stated they can be removed “once the conflict is completely resolved”. The ‘pro-European’ parliament thus cannot completely ignore the president even if it wants to. A direct clash with the president (albeit with limited powers) might cause a political crisis and possibly a geopolitical row with Russia, who will have more legitimacy to step into Moldovan political games. Conversely, it is clear that the president-elect is very unlikely to ‘turn’ the country to the East entirely. First of all, Moldova’s trade with the EU (mostly Romania) under the Deep and Comprehensive Trade Agreement (DCFTA) now consists of up to 60% since the agreement was signed in 2014. It is Moscow’s various impromptu trade embargoes on Moldovan agricultural products over the past years that shifted Moldova’s exports to a more predictable European market. Besides, the president-elect should not forget about the strong influence of the vast Moldovan diaspora living in the West, who voted heavily against him. In a weak Moldovan economy, the diaspora is de facto keeping the budget afloat through remittances. A stubborn and radical pro-Russian stance will further divide the country to its own detriment. Moldova therefore faces an unprecedented political challenge by having one foot in the East and one in the West. The unfavourable scenario would see an East-West tug of war between the president and the parliament, leading the country to a political stalemate. Even worse, the elite could merely simulate their differences for the public eye, while engaging in backdoor deals for their personal gain. One can only hope that in the last, albeit less likely scenario, the young Moldovan democracy will learn to deal with this unprecedented geopolitical cleavage within its elite in order to create its own system of checks and balances, no matter how peculiar it may seem at first sight. Without an active civil society, independent media and stronger judicial and educational systems – this sole plausible scenario will remain a hope.